Grand American road racing champion Wayne Taylor spent the majority of last week practising for his inaugural effort at the International Race of Champions (IROC) race at Daytona International Speedway – writes Russell Wittenberg. Three days on the high banks of Daytona, and driving a front engine race car for the first time, was a challenging experience for the 49-year-old Taylor. Round 1 (of 4) of the Crown Royal IROC Series, an invitation-only series which features 12 of the best drivers in the world, competing in identically prepared Pontiac Firebirds in a 40-lap sprint race, will kick off the 2006 season on the 2.5-mile tri-oval Daytona superspeedway on February 17. The IROC Series of late has become somewhat of a farce outside of the NASCAR world. For pretty much the whole of the last decade, road racers and their series have been ignored by the IROC Series. IROC had basically turned into a NASCAR all-star race run exclusively on NASCAR type oval courses. Last year, Scott Pruett and Max Papis where invited from the Grand Am series, which marked the first real representation of road racers since 1995, when IMSA's Hurley Haywood and Steve Millen, along with Trans-Am's Tom Kendall, competed. Throughout the '70s and '80s the IROC series had an interesting and international mix of stock car, open wheel and road racers competing on a mixture street, natural and stadium courses. The '70s era included world caliber drives such as Mario Andretti, Jacky Ickx, Al Holbert, Peter Gregg and Brian Redman, representing the FIA, FISA and IMSA. The driver invitations continued to impress throughout the '80s and early '90s with names like, Emerson Fittipaldi, Jochen Mass, Hans Stuck, Martin Brundle, Geoff Brabham, Juan Fangio III and Davy Jones. This year’s June 29 IROC race at Daytona will run the infield road course, which hasn't been used in the IROC since its inaugural season in 1973-74, won by legendary driver Mark Donohue. Road courses have been absent from the IROC series since the 1991 event at Watkins Glen. David Donohue, son of Mark Donohue, the first IROC Series champion in 1974, is serving as an IROC driving coach for Taylor, along with other veteran Crown Royal IROC test drivers. “Having David Donohue as a test driver with IROC this year is especially good for me, as we do know each other and both come from the Grand-Am Series,” added Taylor. Taylor and teammate Max Angelelli, were invited to compete in the 2006 running of the 30th annual Crown Royal IROC Series because of their Drivers’ Championship in the 2005 Grand American Rolex Sports Car Series. Taylor and Angelelli will each drive two of the four races, which are being counted as a single entity in the standings and replicating the Grand American Road Racing format – an IROC first. Taylor will drive the season-opener on the Daytona superspeedway and the IROC finale at Atlanta Motor Speedway on October 24. Angelelli will compete in Round 2 at Texas Motor Speedway on April 7 and at the Daytona International Speedway road course on June 29. Car set-up, qualifying and pit stops are eliminated from the IROC race formula so as to make conditions as equal as possible for the drivers of different racing disciplines. The overall points winner(s) will win $1 million, with a total purse of $1.9 million. In the case of Taylor and Angelelli, they will be considered ‘one entity’. Their combined points will be judged against the other individual drivers. 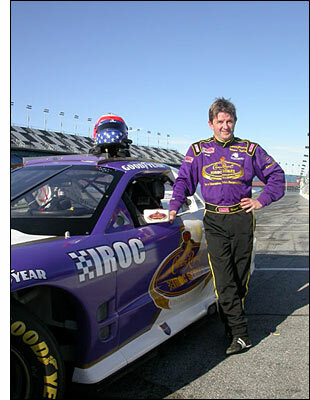 Other drivers for the 30th running of the Crown Royal IROC Series include Mark Martin, Tony Stewart, Martin Truex, Jr., Steve Kinser, Ted Musgrave, Frank Kimmel, Carl Edwards and Matt Kenseth – plus Sam Hornish and Scott Sharp from the IRL and Max Papis. Hopefully the inclusion for the second year of Grand Am racers will signal the start of a trend to bring the IROC series back true to its name, and become again as it once was, a real International Race of Champions.